For other uses, see Vasuki (disambiguation). Vasuki is a nagaraja, one of the King serpents of Hindu mythology and Buddhist mythology. He is a king of the nagas and has a gem called Nagamani on his head. Manasa, another naga, is his sister. Vasuki is Shiva's snake. He is known in Chinese and Japanese mythology as being one of the "eight Great Dragon Kings" (八大龍王 Hachi Ryuu-ou), amongst Nanda (Nagaraja), Upananda, Sagara (Shakara), Takshaka, Balavan, Anavatapta and Utpala. Vasuki is famous for coiling around the neck of Shiva. Shiva blessed Vasuki and wore him as an ornament. 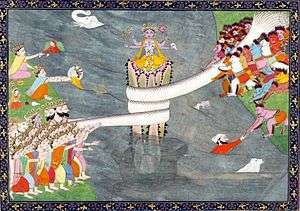 The most famous legend in Hinduism in which Vasuki took part was the incident of Samudra manthan, the churning of the ocean of milk. In this legend, Vasuki allowed the devas (gods) and the asuras (demons) to bind him to Mount Mandara and use him as their churning rope to extract the ambrosia of immortality from the ocean of milk. Vasuki is also mentioned in other Hindu scriptures, such as in Ramayana and Mahabharata. In Buddhist mythology, Vasuki and the other Naga Kings appear in the audience for many of the Gautama Buddha's sermons. The duties of the naga kings included leading the nagas in protecting and worshiping the Buddha, as well as in protecting other enlightened beings. Vasuki's Naga priest is Tatig Naga. Vasuka (or Vasuki) is the name of a small Nair and pedireddla clan found near Mannarasala in Travancore and also Visakha district in Andhra Pradesh. They claim that their ancestors were Nāga serpents spared when the Khandava Forest (modern day Delhi) was burnt and cleared by Krishna and the Pandavas to make way for their capital Indraprastha. 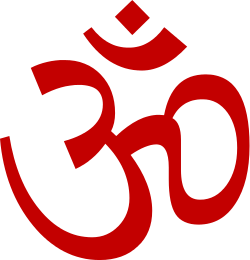 Wikimedia Commons has media related to Vasuki.